The electrical lineman program prepares individuals to build, repair, and maintain electrical distribution systems (EDS). Job duties include stringing new wire or maintaining old wire, installing and maintaining insulators, setting towers or poles to hold electrical wire, assembling and erecting substations, installing and repairing traffic or train signals, and tree trimming. Linemen are in high demand during natural disasters such as tornados, ice storms, and hurricanes. Individuals who graduate with this certificate will have the basic knowledge and skills of electrical distribution. According to the Big Country Electric Cooperative (BCEC), 25% of their employees are over 50 and expecting to retire within the next 5 to 7 years, a trait that is characteristic of other area electric cooperatives. As such, the industry will soon be faced with a significant shortage of experienced and knowledgeable workers. However, the huge demand for line workers becomes an opportunity for those trained in electrical distribution systems (EDS) to secure a great job at a good salary with attractive benefits. 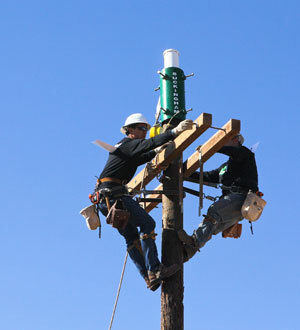 According to the Labor Market and Career Information unit of the Texas Workforce Commission, data calculates out to a mean hourly wage of $20.71 for Electrical Power-LIne Installers and Repairers within the West Texas region and adjoining workforce districts. The statewide mean hourly wage is $20.21 with an employment growth rate of 9.20% through the year 2014. As part of WTC's Alcohol/Drug policy, random, reasonable cause and post-accident drug and alcohol tests are performed on lineman students during their year of training. Insurance is required of all students entering the program. Course descriptions and tuition and fee information are available in the Catalog.